Since the year before I got married, it's become an annual ritual, an immutable part of my life. For one week every summer, my husband's family all get together in a bunch of little apartments down by the beach, on the Outer Banks of North Carolina. The horde of us are about thirty strong, these days, and with the sun and sand and waves, it's the perfect chance to step away from the worries of the world. That's where I was last week. But there's no walking away from video games anymore. Not in 2012. The youngest, a third-grader, kept playing a baseball game on his parents' iPad. All of the 14-25 set played Facebook games, as did some of their parents. One of the teenage boys peppered me for recommendations for games he hadn't already played. (Mass Effect, I told him.) And late in the evenings, when near-daily storms settled in along the coast and broke the night's darkness with panoramic lightning, the whole mob got together indoors for trivia games and game shows. The Price is Right is a perennial, high-demand favorite among the Cox clan. In all the different kinds of games that got played and talked about through the week, though, my favorite moment came with one fifteen-year-old girl and the experience that is Journey. E's family doesn't have a PlayStation or an Xbox. They play Wii games mostly, and games on their computers and phones. So she was hesitant when we first handed her the PS3 controller and set her loose in the sands. "How do I walk?" "What do the buttons do?" "Can I talk?" "What am I supposed to do?" "Where am I supposed to go?" We wanted to help her, to tell her what she needed to know and to give her guidance, but we didn't want to tell her what to do. It's a difficult line to straddle. "Just explore," we suggested ineffectually. "The game will tell you which way to go." She wandered, and immediately fell in love with the sand surfing mechanic. "It's so pretty!" she exclaimed, and she was right. But still, even while falling in love with the world, she foundered when it came to navigating it mechanically. She could explore, but the elements that were "game" seemed to be passing her by. She was having trouble pursuing fragments of scarf, or finding hidden glyphs among the rocks. We called the player "he," although of course it could have been anyone. 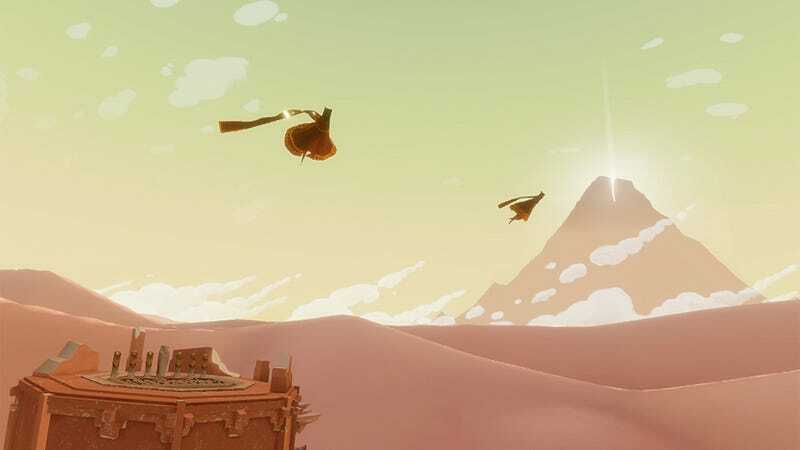 In Journey, a white scarf player is someone who has found everything the game has to offer: every glyph, every secret. There is nothing new under the hot desert sun for that player to find, when playing again. The white scarf player is a guide. While we hung back, wanting to let E discover her own path, White Scarf carefully and patiently guided her through a number of levels. With no hands to gesture and no language to speak, White Scarf shepherded her through danger, let her explore, and was there to help her find the treasures of knowledge. Like a parent, White Scarf helped E through the hard parts, and yet stood back when she was figuring it out on her own. He guided her to shelter when she couldn't yet do it for herself, and taught her how to manage independently. He helped her fly, and then let her take wing. For an hour on a humid afternoon, a stranger somewhere in the world made that kid's day. He vanished sometime before E climbed the snowy mountain, but by then she was firm on her feet and knew what to do. When E finished her journey, and the list of people she had played with came up (there are always more of them than you remember ever noticing) we made a note of the player who had been White Scarf and sent a thank-you note. I want him (or her) to know what a fantastic, transcendent effect that cooperative game had, and to say thank you for the help. E is a middle child. Her sisters, 12 and 18, are both fairly high maintenance, though in different ways. She gets lost in the shuffle sometimes, especially when the whole great mob of the family comes together, and she gets pushed around enough as it is. But Journey gave her room to explore. And the silent, cooperative multiplayer let her accept help on her own terms. Her Journey was different from mine, in large part thanks to a stranger. And I'm so very glad I got to see it.